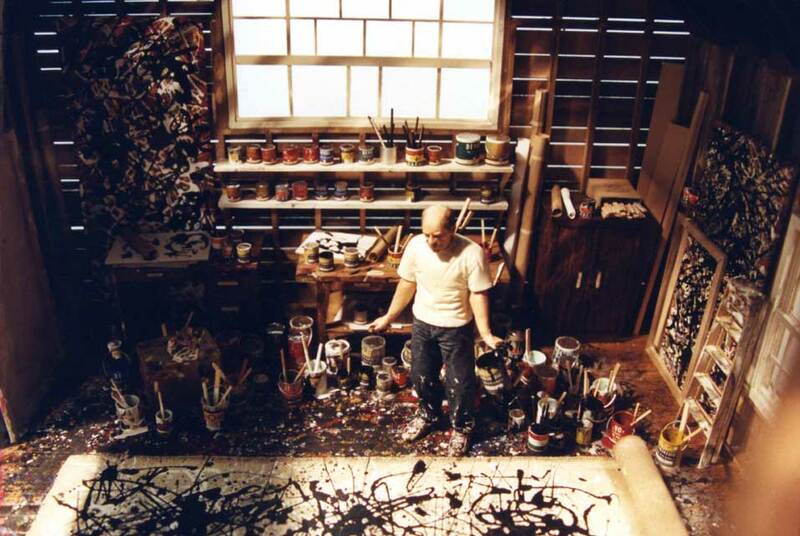 "Joe Fig", Jackson Pollock, 1951, 2002. Interior view. Courtesy: Ronnie and John Shore. CHICAGO, IL.- Curated by Michelle Grabner (SAIC) and Annika Marie (Columbia College), "Picturing the Studio" is presented in conjunction with the College Art Association's 98th Annual Conference in Chicago, February 10-13, 2010. With works by more than 30 artists spanning the past two decades, the exhibition is testament to the compelling nature that the studio itself holds as subject as well as place of production. "Picturing the Studio" features site-specific works by New York artist Ann Craven, SAIC alumna and Los Angeles based artist Amanda Ross-Ho, and SAIC faculty Judith Geichman and Frank Piatek. Major, iconic works by Rodney Graham, Bas Jan Ader, Matt Keegan, James Welling, David Robbins and Karl Haendel are intersleeved among excellent examples of work by Chicago-based artists who take on the studio as subject. "The privileged space of the studio remains an important domain for the artist," notes Grabner, SAIC professor and chair of the Department of Painting and Drawing. The very range of works convenedphotographic documentation and drawings of celebrated studios, the transposition of the contemporary artist's studio into the space of the gallery, theatrical tableaux evidencing its impact on the physical state of the artist's body, delicate line contours of workshop paraphernalia, and so forthillustrate the heterogeneity of artistic strategies, modalities, and scales of embodying the studio. While "Picturing the Studio" offers no clean closure to these questions, what it does seek to show are instances of artists working in, on, and through the studio as a special site of attention. Bas Jan Ader, Conrad Bakker, John Baldessari, Stephanie Brooks, Ivan Brunetti, Ann Craven, Julian Dashper, Dana DeGiulio, Susanne Doremus, Joe Fig, Dan Fischer, Julia Fish, Nicholas Frank, Alicia Frankovich, Judith Geichman, Rodney Graham, Karl Haendel, Shane Huffman, Barbara Kasten, Matt Keegan, Daniel Lavitt, Adelheid Mers, Tom Moody, Bruce Nauman, Paul Nudd, Frank Piatek, Leland Rice, David Robbins, Kay Rosen, Amanda Ross-Ho, Carrie Schneider, Roman Signer, Amy Sillman, Frances Stark, Nicholas Steindorf, and James Welling. Opening an exciting new season, SAIC is pleased to present Picturing the Studio and Breathing is Free: 12,756.3New Work by Jun Nguyen-Hatsushiba. Information on all exhibitions in the Sullivan Galleries and Rymer Gallery, as well as the student-operated Student Union Galleries, is available below. Also included is information on three off-site exhibitions with area partners, and feature presentations of SAIC faculty and alumni in the Art Institute of Chicago's Modern Wing.